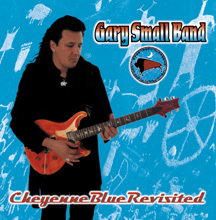 Guitarist/singer Gary Small, a regular fixture on the Portland blues scene for several years, has received a nod from the Native American Music Association (NAMA) for his 2000 blues release "Cheyenne Blue Revisited". Small received a nomination for Best Blues/Jazz Recording for the 2001 Nammy Awards. The awards show will be held at the Sandia Casino in Albuquerque NM, October 20th. NAMA has opened the voting polls to the general public and music fans can vote by going to www.nammys.com before September 24th. Small is Native American and a tribal member or the Northern Cheyenne Tribe whose reservation is located in remote southeastern Montana where the majority of his family resides. Cheyenne Blue Revisited is Small's tribute to a multitude of Small's influences and the CD covers a wide gamut of Blues styles. What separates this blues recording is what Small describes "I bring my Indian-ness to the blues. We have our own brand of humor, a unique way of looking at the world, and definitely a different perspective once you take a hard look at the history of Indians here in the land of the free and the home of the brave." The NAMA nomination comes hot on the heels of Small's recent Native American release "Wild Indians" which was released July 21, 2001. The release is a full-blown perspective of Native America dealing with the issues of present day conditions and problems facing Native Americans today. The Willamette Week described Small's guitar prowess and song writing "...Small's guitar playing so reminiscent of Carlos Santana it's stunning... Small could become the Santana of Native American music." (John Graham, Willamette Week, July 18th, 2001). The Native American Music Awards made its historic debut as a sold out show in 1998. The Awards was a huge success and highly acclaimed for its professionalism, beauty, inspiration, and method of providing overdue recognition for an indigenous art form. The Awards received overwhelming national and international press coverage ranging from CBS This Morning, Associated Press, USA Today, A&E's History Channel, and the Wall Street Journal to La Voce Italiana and the International Herald Tribune. Native artists such as Robbie Robertson and Rita Coolidge have performed at previous Awards shows. The First Annual Native American Music Awards were aired on A&E's History Channel and on PBS's/MSG Metre Arts Channel 13 in New York City.